This sign, promising a sweet destination, has hung at 72 South Broadway for over 40 years. Despite a devastating fire that struck the week of the Brinks robbery in 1981, a succession of owners, and the vicissitudes of an economy that is not kind to small business, Strawberry Place is forever. This kingdom built on ice cream and flapjacks elevated by a succulent red berry with white seeds and a green leafy crown has reached iconic status, evidenced by the lines that form every weekend for brunch. I can’t remember my first serving of strawberry ice cream, but I can remember my first Strawberry Place ice cream cone. It was the summer of 1976 and my father brought me and my friends Danny and Dean to the curbside window. The size of the strawberries and the richness of the cream were a revelation. That is now the taste I chase whenever I sample a serving of strawberry ice cream. The bottom tip of the cone was consumed before we made it to the Post Office, barely one block away. The first Strawberry Place opened in the late 1960s as one of three franchises, according to Vinnie Cuccia, the owner, chef and scion of the family that has owned the business, on and off, for decades. The other two Strawberry Places were in Florida and Connecticut according to Cuccia. 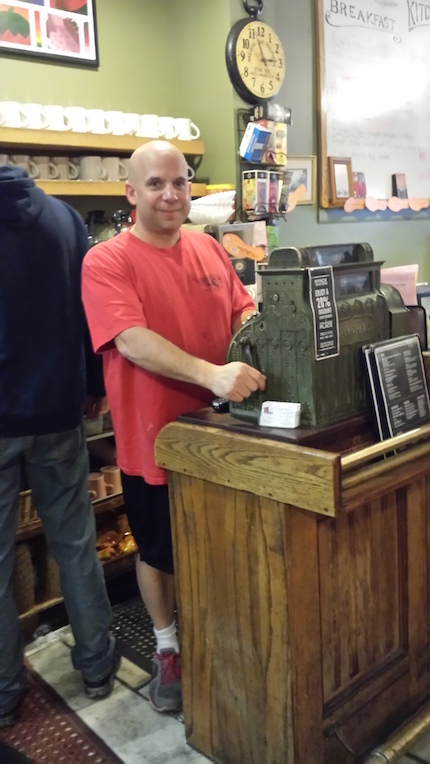 In 1974, his parents, Vinnie and Cecelia Cuccia, bought the building and the popular ice cream parlor. 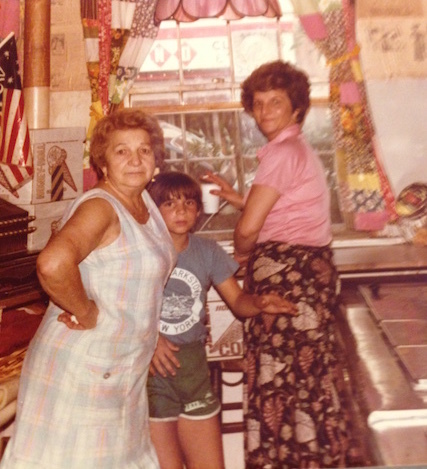 Cecelia Cuccia was a fixture, holding court from behind a 1904 cash register that was used by a restaurant that once operated from the location. Her daughters Renee and Jody worked at her side. This building was erected by Tunis Depew in 1889 as the Depew Place block. In 1980, the Cuccias sold the restaurant. Five years after I had my first Strawberry Place ice cream cone and a year after the Cuccia’s sale, the building was gutted by a fire. The blaze started on Sunday, October 26 in the ground floor kitchen and spread to the upstairs apartments. Earlier that week, on Tuesday, October 21, two local police officers, Waverly Brown and Edward O’Grady along with a Brink’s armored car guard Peter Paige were murdered during a bank robbery. On the same day of the fire, an elderly woman was killed by a car while crossing Route 59, a quarter mile from the scene of the shootout. The first responders who subdued the flames at Strawberry Place must have been battle-weary after a week of senseless violence that shook Rockland County. After the fire, the Cuccias re-acquired their beloved Strawberry Place. In 1990, Vinnie’s parents called him with an offer,“You always wanted to run a restaurant. How about you start a few months from now.” Vinnie was studying Small Business Management at Quinnipiac College. “I learned more from working with my mother and father in my first six months than I did in four years of college,” Vinnie said. During this period, the interior of the restaurant was renovated with custom woodwork including tables and finishes by Joseph Capasso. The future of the Strawberry Place as a family business seems secure. Joining Vinnie to staff the operation are his sister, Jody, his brother-in-law, Karl, and his nieces, Alaina, Jennifer, Taylor, Dominique, and long-time employees who feel like family. Vinnie’s children Gianna and Vinny Jr. are often around, adding to the restaurant’s family-friendly ambiance. Apparently Vinnie’s son is also taking notes. “The other day, Vinnie Jr. was talking about the new items that he wants to put on the menu when he takes over,” the proud father reported. Vinnie Sr. is also putting new touches on the classic Strawberry Place menu. What started out as an ice cream parlor is now a breakfast and brunch restaurant and catering business. “We just added vegan waffles and pancakes because people have been asking for them.” According to Vinnie the most popular item on the menu is the Nutella Stuffed French Toast topped with bananas and strawberries. But I think there is something else that Strawberry Place offers that keeps people coming through the door. Everything in this modern world is in a constant state of flux. Aspects of our lives that once remained unchanged for decades, like the landscape, careers, and relationships are now temporary at best. As the pace of change accelerates, there are some appetites that people wish to sate that are as important as sustenance. 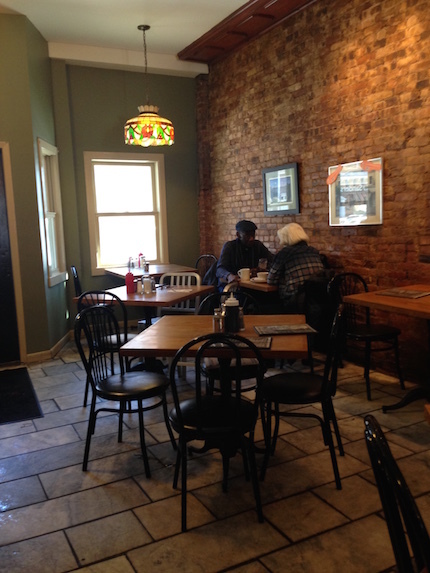 When an eatery endures, familiarity becomes the most satisfying item on the unprinted menu. Visit Strawberry Place on Facebook. Nyack Sketch Log, Volume 2 will be available the last week in November. 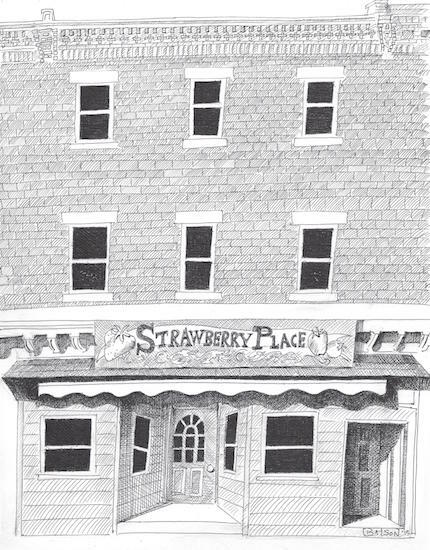 Strawberry Place is one of the fifty-five sketches and short essays in this new volume. Purchase an advance copy and get $5 off the cover price. Email your interest to wrbatson@gmail.com or stop by the Bill Batson Arts tent at the Nyack Farmers’ Market on Thursdays. The Nyack Sketch Log is sponsored each week by Creative Financial Planning and Weld Realty.